Updates from members, the media, and more. For Upcoming Concerts, click here. April 28, 2017 The Richmond Symphony Chorus performs an all-choral concert dedicated to its founder, James Erb. For the first time, many of Erb's arrangements of traditional Welsh, Irish, and American songs were recorded and will be made available for purchase. ​February 19, 2017 Members of the Richmond Symphony Chorus perform Poulenc's Gloria at Carnegie Hall, as part of a larger chorus conducted by RSC Director Erin R. Freeman. August, 2016 Richmond Magazine recognizes the Richmond Symphony Chorus in its "Best of 2016 Readers' Choice" awards, citing the Chorus's "rigorous auditions and range of voices." 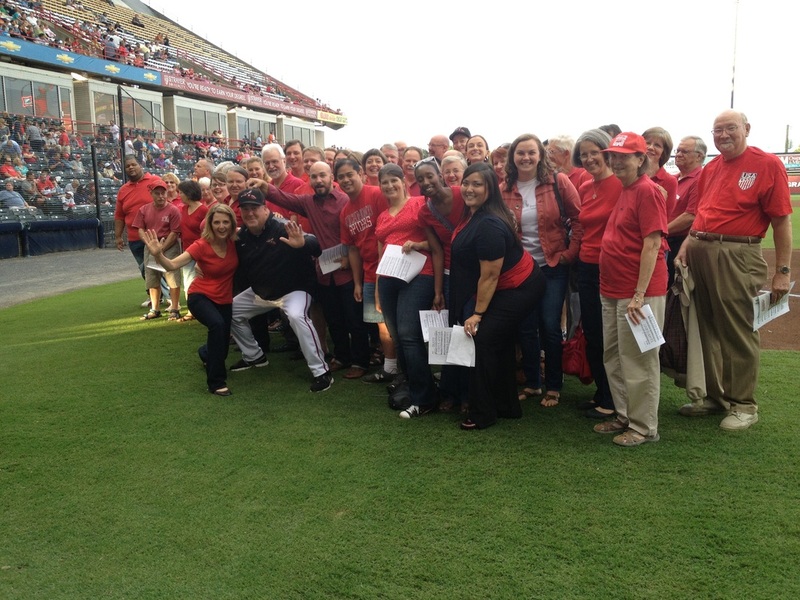 June 18, 2016 Members of the Richmond Symphony Chorus perform the national anthem at the Richmond Flying Squirrels baseball game. February 15, 2015: Richmond Symphony Orchestra and Chorus, with One Voice Chorus, present an "ambitious" and "breathtaking" performance of works by Duke Ellington. The Richmond Symphony Orchestra and Chorus performed four selections from Duke Ellington's Sacred Service on February 14, 2015, with guests Lester Lynch, One Voice Chorus, and a Big Band assembled from some of the finest Jazz musicians around the Commonwealth. Markus Schmidt, of the Richmond Times Dispatch, called the performance "ambitious" and "breathtaking", and commented on the musical flexibility of the performers, who "left no doubt that they could swing hard and strong, with the ability to go “outside” if they chose to, but retaining enough of the basics to go back “inside” and groove with the spirit of the blues." Read the entire review here. January 26, 2015: Virginia Choral Directors Association honors RSC founder James Erb. This just in from ACDA: "At All-Virginia Chorus, we will have the opportunity to honor the life of James Erb by singing his arrangement of Shenandoah." Thank you VCDA and All-Virginia Chorus guest conductor, Dr. Brady Allred for this lovely tribute. January 25, 2015. James Lowery, in memorium. The Richmond Symphony Chorus family mourns the loss of vibrant, generous, and musical tenor, James Lowery. Jim was a long time member of the RSChorus, was always willing to lend a hand, led warmups and rehearsals, and made a difference until his final days. We will miss him greatly. January 14, 2015. Members of the Richmond Symphony Chorus perform the National Anthem for the opening session of the Virginia General Assembly. Members of the Richmond Symphony Chorus braved an icy day to open the Virginia General Assembly 2015 session with the National Anthem. This is the fourth year in a row the RSChorus has been given the honor of performing for the leaders of the Commonwealth. Watch the video here. November 1, 2015. The Richmond Symphony Chorus performs Carmina Burana with the Richmond Ballet and Richmond Symphony. Donned in robes and peppered through the concert hall, the Richmond Symphony Chorus performed in Richmond Ballet's historical and powerful performance of John Butler's Carmina Burana. The Richmond Times Dispatch called the performance "rare," "memorable," and "total masterpiece," and said of the RSChorus: "The Chorus, clad in hooded black robes, surrounded the audience, both physically and with sound. They filled the area on both sides of the orchestra pit as well as the balcony with the sheer numbers of their physical presence as well as with their swelling vocal power." To read the full review, click here. October 19, 2014. The Richmond Symphony Chorus 'shakes the rafters' in Mahler Second Symphony. The Richmond Symphony Chorus joined the Richmond Symphony and soloists for a thrilling performance of Mahler's Second Symphony. Gene Harris of the Richmond Times Disptach wrote "the Richmond Symphony, soprano Michelle Areyzaga, mezzo-soprano Jennifer Feinstein and the Richmond Symphony Chorus filled the stage of the Carpenter Theatre at Richmond CenterStage, and their combined sound shook the rafters." Read the full review here. September 10, 2014. Members of the Richmond Symphony Chorus perform at the State Capitol at the National Speakers' Conference. 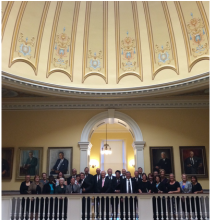 Surrounded by official portraits of former VA Governors and underneath the iconic Capitol Dome, designed by Thomas Jefferson, Members of the Richmond Symphony Chorus performed for Speakers of the Houses from all 50 States. Invited by the Speaker of the Virginia House of Delegates, William J. Howell, the ensemble performed the National Anthem, a spiritual by William Dawson, "Virginia" by Jimmy Dean, and John David's inspiring "You are the New Day." In addition, they gave the performance premiere of "Our Great Virginia," a new version of the beautiful "Shenandoah" tune with lyrics by Mike Greenly. The Richmond Symphony Chorus has now not only impacted the community of Central Virginia, but it now holds an historic place in the Commonwealth of VA and across the nation. May 18, 2014. The Richmond Symphony Chorus was joined by the Virginia Symphony Chorus to perform Berlioz' Damnation of Faust under the direction of Steven Smith. Sung in French, the work required the amassed chorus to become peasants, drinkers, soldiers, students, pilgrims, and demons. They sang in French, Latin, and a made-up language worthy of the underworld. Music critic Clarke Bustard called the performance "dramatically potent as any staged opera seen and heard here in recent years" and described the chorus as "consistently characterful and dramatically charged." Read the full review here. March 8, 2014. Members of the RIchmond Symphony Chorus sang the National Anthem at the VCU basketball game! Several members of the Richmond Symphony Chorus sang the National Anthem for the final home game of the VCU Men's Basketball team. A sold out crowd cheered on the singers before honoring the senior players of one of the best basketball teams in the country. Go RAMS! And Go RSC! 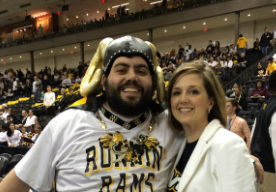 To the left, Richmond Symphony Chorus Director Erin Freeman poses with RSC Tenor AND famed VCU RAMS icon, Chris Crowley (aka VCUPav). January 8, 2014: Second annual appearance at the VA General Assembly opening session. For the second year in a row, the speaker of the house of delegates requested that the Richmond Symphony Chorus perform the National Anthem at the opening session. 25 members of the chorus braved frigid temperatures to sing in the historic space. Watch the video on the Richmond Times Dispatch site here. To the right: Members of the Richmond Symphony Chorus with Thomas Jefferson in the entrance to the VA State Capital building. January 1, 2014: A new year means new members! Happy New Year from the Richmond Symphony Chorus. We welcome the following new members to the chorus: Sopranos Colleen LaButta, Louise Daraskevich, and Leslie Maloney; Altos Chelsea Cockburn, Ida Girma, and Kayla Robbins; Tenor David Brown; and Basses Arthur Grant and Don Irwin (who is a returning member!). December 10, 2013: A busy weekend yields outstanding results. The Richmond Symphony Chorus participated in a performance of Handel's Messiah and two "Let it Snow" Pops shows - all on the same weekend. Messiah ticket sales surpassed goals and received rave reviews. Clarke Bustard of Letter V called this year's performance: "one of the most dramatically charged in recent memory." He continued: "Erin R. Freeman ... obtained highly dynamic, truly theatrical treatments of many of the oratorio’s choruses, notably the sequence at the beginning of Part 2 that frames the alto air “He was despised,” and set markedly brisk tempos for many airs and choruses....The chorus “He trusted in God” and the bass air “Why do the nations so furiously rage,” both in Part 2, came across with real fury. The chorus “O thou that tellest good tidings to Zion,” in Part 1, which can sound rather ceremonial, here was a joyful outburst......The Richmond Symphony Chorus, its singers mixed rather than divided into sections, sang with energy, expressiveness and generally excellent diction.....The large audience attending this performance showed none of the tell-tale signs of restlessness. Chances are, the roaring ovation at the end would not have been diminished if the five missing numbers, adding about 8 minutes, were performed as well." Anne Timberlake of The Richmond Times Dispatch wrote: "Fortunately, “Messiah” isn’t something you tire of, as the Richmond Symphony and the Richmond Symphony Chorus proved Friday evening at the Carpenter Theatre in a vigorous rendition of Handel’s masterwork. Erin Freeman led the annual performance, which featured vocal soloists Michelle Areyzaga, Kendall Gladen, William Ferguson and Sumner Thompson in a 21/2-hour-plus megadose of the beloved work. Friday’s “Messiah” featured brisk tempos — the better, perhaps, to dispatch the work in under three hours — solid vocal runs and precise synchronization of consonants by the Richmond Symphony Chorus." The Annual Let it Snow Pops concert was the highest selling Holiday Pops in the Richmond Symphony's 50+ year history. Featuring the RSChorus, the Richmond Symphony Orchestra, Soprano Lisa Edwards Burrs, and a children's chorus created for the occasion, the concert ran the gamut from traditional classics, such as Berlioz's Shepherds' Farewell, and unexpected surprises, as in the music from It's a Wonderful Life. October 21, 2013: Verdi Requiem. The reviews are in! In Letter V, Virginia's Classical Music Blog, Clarke Bustard said: "Intense quiet was one of the most effective tones of voice in this choral performance. From the opening "Requiem" through the conclusion of the Mass, the Symphony Chorus created striking effects of shadowed tone and distance in its sotto voce singing. In louder and more turbulent passages, notably the recurrent Dies Irae, the choristers projected energy and passion, and demonstrated gratifying attending to detail in more complex sections." Anne Timberlake, in the Richmond Times Dispatch, wrote "Perhaps most satisfying were the crisp consonants and dynamic contrasts of the perennially fine Richmond Symphony Chorus. Like that sizzling bacon, the chorus, a community institution for many decades now, seldom fails to sate." Read the full reviews here: Letter V and Richmond Times Dispatch. September 8, 2013: The Richmond Symphony Chorus records Durufle and Bruckner. In late summer, the Richmond Symphony Chorus released a recording of Durufle's Requiem, featuring Michael Simpson on Organ, and three motets by Bruckner, with the spectacular trombone section of the Richmond Symphony. Many thanks go out to Arts Laureate for the recording services, AFM 123 and the Richmond Symphony Brass for the technical assistance, and RSC members Ed Galloway and Carl Eng for managing the project. For more information on RSChorus recordings and broadcasts, visit the Media page. August 15, 2013: Third Annual National Anthem performance at the Flying Squirrels game. For the third season in a row, the Richmond Symphony Chorus sang the National Anthem at Flying Squirrel's baseball game. With fireworks, cool weather, and a come-from-behind victory for the home town team, it was a perfect evening. Left: Nutzy the Squirrel conducts a "warm-up." Right: The chorus poses with Director Erin Freeman and Batting Coach Ken Joyce. July 8, 2013: Two members of the RSChorus on All-Things Considered. David Hood and Dillard Watt, two members of the RSChorus AND Richmond's own NoBS Brass Band receive rave reviews from Jim Fusilli on NPR's All-Things Considered. Listen up here. And, for more on the NoBS Brass, visit their website! June 1, 2013: Congratulations to Alto Ellen Broen. We are proud of Richmond Symphony Chorus alto and member of the RSO Vocal Apprenticeship Program, Ellen Broen, for receiving a scholarship to the Westminster Choir College. Ellen will pursue her Masters in Vocal Performance and Pedagogy, studying with Laura Brooks Rice. May 1, 2013: Welcome Twelve New Members. After a full evening of auditions, including singing Bach chorales, intoning rhythms, and speaking German, we are pleased to welcome 12 new members! Congratulations to Molly Bouffard, Eve Minter, Jenny Albert, Maddy Clatterbuck, Allison Elliott, Pam Cross, Anna Windburne, Dustin Shuman, Jeremy Scott, Joshua Spranger, John Schultz, and Dillard Watt. April 15, 2013: Auditions for 13-14 season announced. The Richmond Symphony Chorus will offer to rounds of auditions for prospective members. The first round will be May 7, and will cover the entire 13-14 season. Another round will be offered in August, and will cover membership in the chorus after the October performance of Verdi Requiem. For details, visit our Auditions and Membership page. March 30, 2013: Repertoire Announced for the 2013-2014 Season! The Richmond Symphony Chorus will feature prominently in next year's season with large projects, intimate performances, and grand traditions. Repertoire includes: Verdi Requiem, to celebrate the 200th anniversary of the composer's birth; the annual holiday traditions - Let it Snow and Handel's Messiah; Handel Coronation Anthems with the Richmond Symphony Chamber Chorus; and Berlioz's Damnation of Faust, in a partnership with the Virginia Symphony Orchestra Chorus. And, as usual, additional projects will arise throughout the season. To audition for the Richmond Symphony Chorus and participate in this exciting season, visit our Auditions and Membership page. February 16 and 17, 2013: The Richmond Symphony Chorus performed Mozart's Requiem to record-breaking crowds at the Richmond Symphony's fourth masterworks concert of the season. Generating the highest ticket sales in the 56-year history of the RSO, this concert also featured John B Hedges' Prayers of Rain and Wind for double bass and orchestra (and a cameo appearance by the RSChorus). Clarke Bustard, of Letter V - Virginia's Classical Music Blog, said "The Symphony Chorus, which Freeman directs, brought a welcome combination of heft and sensitivity to detail in the Mass." He also remarked: "The conductor and musicians, including an offstage chorus intoning a Southern gospel melody, reveled in the colorful score Hedges crafts for the orchestra." Anne Timberlake of the Richmond Times Dispatch said "Freeman conducted, impressively, from memory, and the always well-prepared Richmond Symphony Chorus performed with dramatic intent." 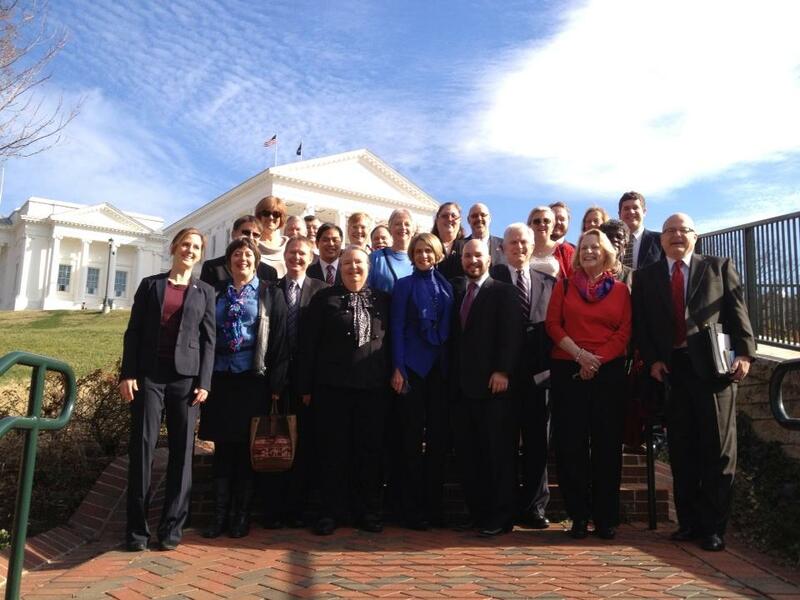 January 9, 2013: The Richmond Symphony Chorus began the year by singing the National Anthem at the opening session of the Virginia House of Delegates. "Wow!" was the reaction from the Speaker of the House, pictured to the right. For more pictures, visit the Richmond Times Dispatch. And watch the video here. December 9, 2012: The 2012-2013 Richmond Symphony Vocal Apprentices, all members of the Richmond Symphony Chorus, performed Handel's Messiah with the orchestra for a standing room only crowd. Second row: Paul Brockman, Stephen Wright, and Erin Stuhlman. Front row: Elise Jenkins, Cynthia Hickman, Ellen Broen, Meredith Outlaw, and Gabrielle Bergeret. November 14, 2012: Recording live in performance in May 2012, the Hampton Roads Classics Label's recording of Mahler's Symphony no. 8 was released on November 2. The Richmond Symphony Chorus joined the Virginia Symphony, Virginia Symphony Chorus, Old Dominion University Chorus, Christopher Newport University Chorus, and Virginia Children's Chorus for this monumental performance and recording conducted by JoAnn Falletta. Read the full press release. 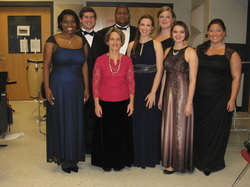 October 30, 2012: Richmond Symphony Vocal Apprentices Named. Read the press release here. 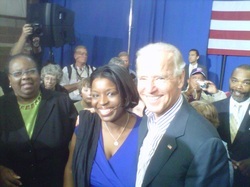 October 10, 2012: Mezzo Soprano and Richmond Symphony Chorus member Elise Jenkins recently had the honor of singing the National Anthem for Vice President Joe Biden. In the background is Joyce Bassette, Music Specialist for the Richmond City Public Schools and great partner with the Richmond Symphony. September 14, 2012: We are pleased to announce that two members of the Richmond Symphony Chorus, Sopranos Gabrielle Bergeret and Elise Jenkins will be soloist on the Richmond Symphony's opening Lollipops concert on October 27. They will have the chance to tap into their inner divas as they perform Rossini's Cat Duet on a program celebrating animals in music! Click here for tickets and more information. May 2012: The Richmond Symphony Chorus joins the Virginia Symphony Chorus and Virginia Symphony to perform Mahler's Symphony No. 8 as part of the Virginia Arts Festival. (See picture above!). Conducted by JoAnn Falletta, the work played to full houses. Read here for more about this historic collaboration.